4.1 out of 5 based on 74 bloggers and 4 commenters. 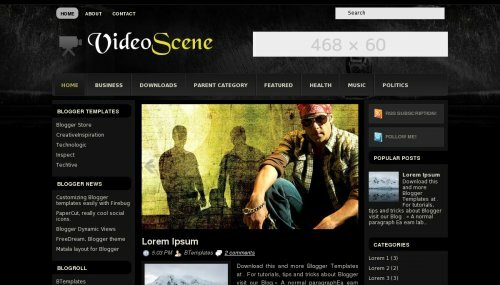 VideoScene is a free blogger template adapted from WordPress with 3 columns, left and right sidebars, rounded corners, grunge style, ads ready, slider, social bookmarking icons, posts thumbnails and drop down menu. Excellent template for blogs about halloween or movies. thanks, i have used this template on my other blog!